…and so I turn to one of the most useful sites for British dog-walkers (cyclists, etc), which can help you answer the questions, “Is it about to rain?” and “How long will this rain last?” At the moment, the former question is largely rhetorical, but the answer to the latter can be very useful. 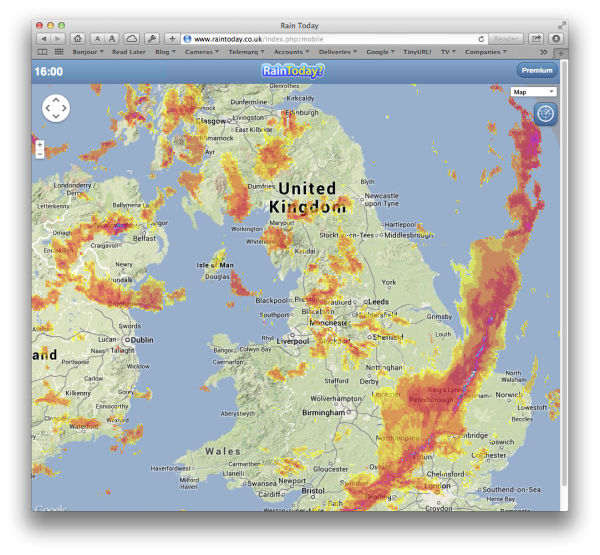 It was Richard who first pointed me at raintoday.co.uk, which gives you a rough animation of the radar precipitation map over the last couple of hours, so you can get a feeling for how fast the clouds are moving. Very very handy. And very British. It’s also worth knowing that if you put ‘/mobile’ on the end of the URL, you lose some features, but you also don’t get any ads. I have it bookmarked on one of the home screens of my iPhone. Sorry, people, but I had to write something, having read no less than three posts today by writers who didn’t know the difference between ‘uninterested’ and ‘disinterested’. You can see how that would rankle. Anyway, it’s very easy: all you need to do is to remember the phrase my English teacher told me, many moons ago… Are you ready? There. Isn’t that easy? Thank you for your attention, everyone. Now I can go to bed with a weight off my mind.